This first release of the Excel-Soccer League Manager is a new development of the well known Excel-Soccer World Cup Planner from the past few years. 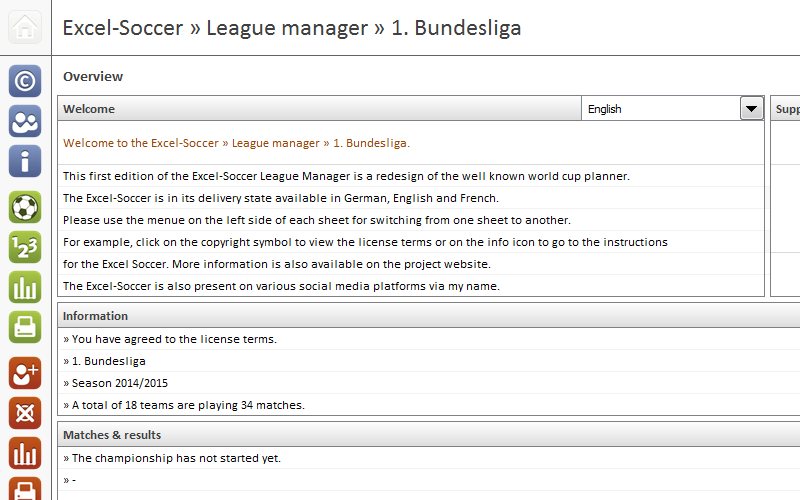 The Excel-Soccer is as available in German, English and French. The Excel-Soccer Basic only uses Excel functions and no macros. The Excel-Soccer Basic is available as a free version. 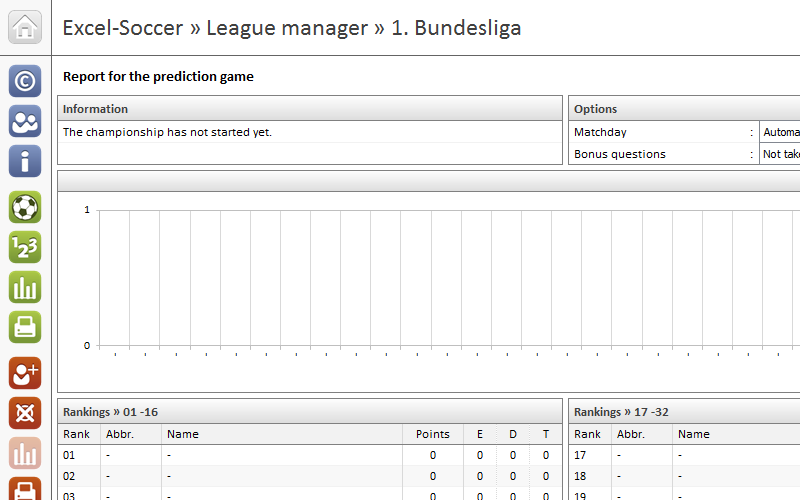 Additionally to the management of the matches for leagues with up to 20 teams, the Excel Soccer Basic includes a prediction game with up to 32 participants. Various settings allow you to fine-tune the application. In the following some instructions how to use the Excel-Soccer Basic and how the software works. 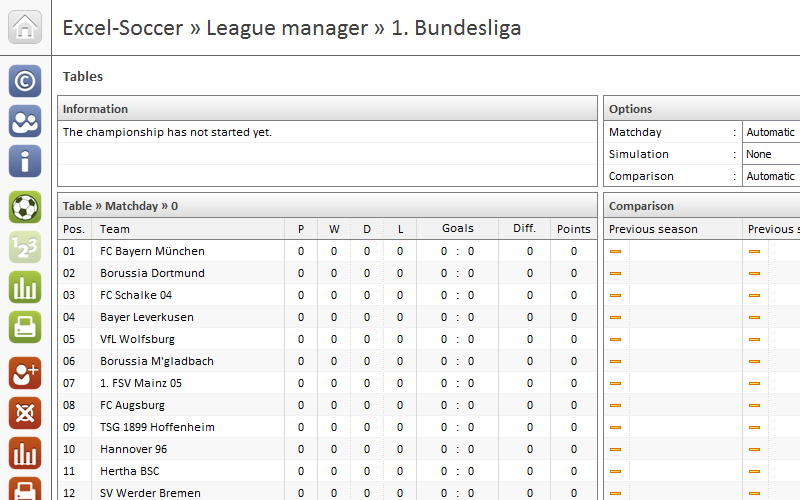 The screenshots are showing the preconfigured league manager for the german Bundesliga. Please note, that the screenshots may be seen as examples and can – in case no changes occured to the features shown in the screenshot – contain dates and version numbers from previous versions. The download section offers more preconfigured versions for the Excel-Soccer, such as for the Premier League, the french Ligue 1 or the spanish league. Click on the headings to view the content of the corresponding categories. 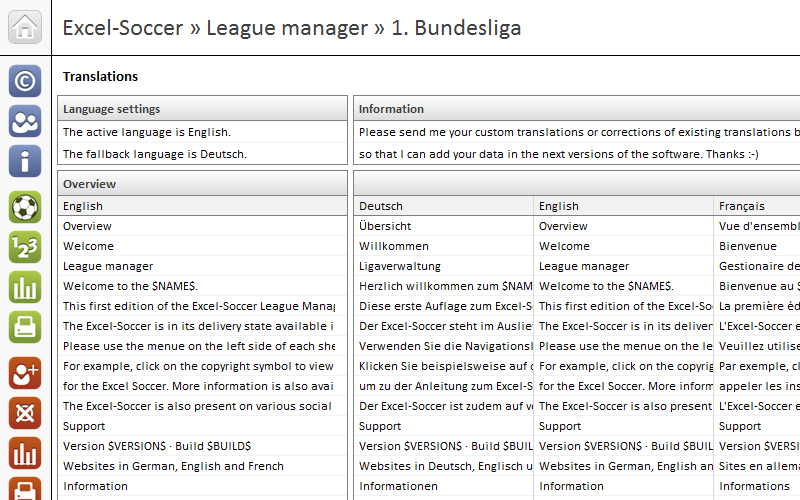 The Excel-Soccer has been tested in Microsoft Excel 2010 and Excel 2013 for the languages German, English and French. As far as I know, the Excel file should alos work in Excel 2007. Older versions of Excel are not supported – and will also not be supported in the future. Additionally, no tests were done with other spreadsheet applications. Depending from the version of the Excel-Soccer you have downloaded, the teams and matches for the current season have already been entered or not. If this is not the case, you have to define the number of teams in the settings for the Excel-Soccer and then enter the teams. The Excel-Soccer assumes that the teams are entered in the order in which they were ranked in the official table at the end of the previous season. The Excel-Soccer uses the system date and time to calculate whether a match has occurred and whether the match results may are required. The Excel-Soccer also takes into account the playing time, the half-time and optionally an average for an additional time. These values are defined in the settings for the Excel-Soccer. In its delivery state, the playing time is set to 90 minutes, the half-time to 15 minutes and the additional time to 0 minutes. The system date and time is also used to calculate the current matchday. If the present day is within the interval to the dates of the matchdays, the Excel-Soccer sets the matchday appropriately. In case your version of the Excel-Soccer does not include the teams and/or matches, you will need to enter them manually. Please note, that you should firstly enter the teams as this data is used in selection lists for entering the matches. You should specify a date for each match. The time is optional. After a match has been played, you may also enter the match result manually. The Excel-Soccer offers you up to four simulations for the match results. These simulations are independent each one from another and will only taken into account for future matches. Therefore, there is no need to manually delete the data for simulated results from the past. The view for the tables/rankings of the teams includes a general table and tables for the home and away matches. 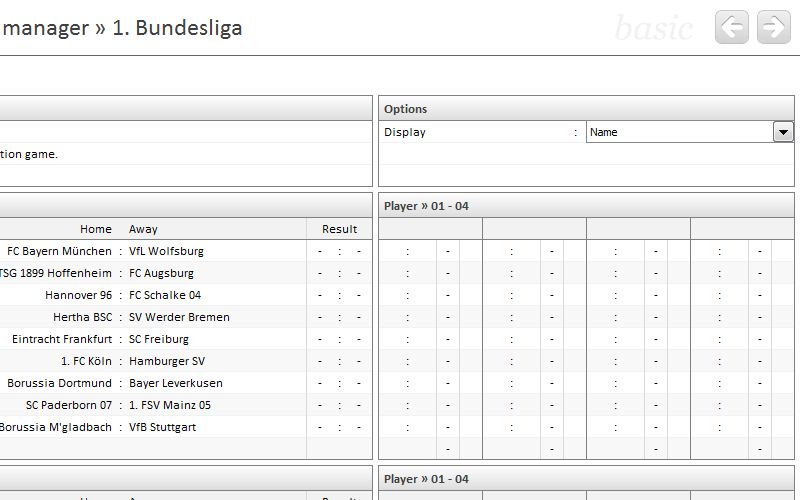 You can choose the matchday in a selection list and, for example, select previous matchdays and view the corresponding tables. Simulated match results will be taken into account in future matches. You can also compare the rankings of the teams between two matchdays. The second comparison is automatically calculated and compares the rankings to the previous season or the first round, depending from the round in which you are. This version of the Excel-Soccer does not take into account a direct comparison of the teams. This also means that, for example, at the beginning of a season where some matchs results may be equal, the rankings can differ from the official table. The report for the matches includes a graphical visualization of the positions of the teams over the time as well as a chart showing the goals scored per team. 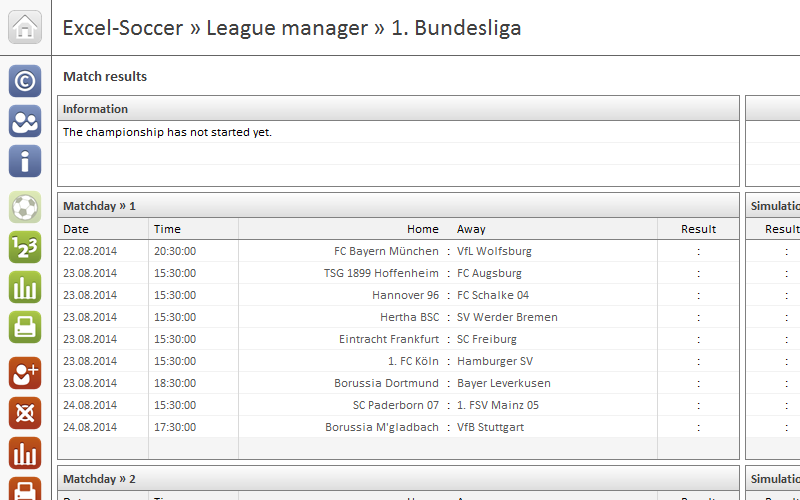 You can either select the matchday manually or keep the automatic calculation for the current matchday. The order of the teams in the chart is corresponding to the order entered in the settings for the Excel-Soccer. Teams can be selected or deselected in the chart. And, simulations are optionally taken into account. This version of the Excel-Soccer allows up to 32 people to participate in the prediction game. Please avoid gaps when entering the participants to prediction game. You can specify in the settings for the Excel-Soccer whether only the first name, the last name or both fields are mandatory. The abbreviation is normally automatically calculated and you can define in the settings whether 2 or 4 characters are used for the abbreviation. It is also possible to override the calculated abbreviation by entering a user defined value in the corresponding column. This is intended to avoid undesirable results such as ‘Susi Sonntag’ which leads to unwanted combinations, especially in Germany. The answers to the bonus questions may also entered into the table for the participants. The application checks the information for duplicate entries and visualizes errors by an exclamation mark on the right. And, the information enetered for the bonus questions is independent frome the state of the bonus questions (active or not). Inactive answers to the bonus questions are grayed out. The predictions by the participants should be entered to the prediction sheet. Incorrect information is as far as possible highlighted. If a match took place, the predictions are slightly grayed out, the points calculated, displayed and highlighted by an icon, according to the settings made. Since macros are not used in the Excel-Soccer Basic, filled fields for matches that had taken place are not automatically locked. The report for the prediction game includes a graphical visualization of the rankings for the participants. 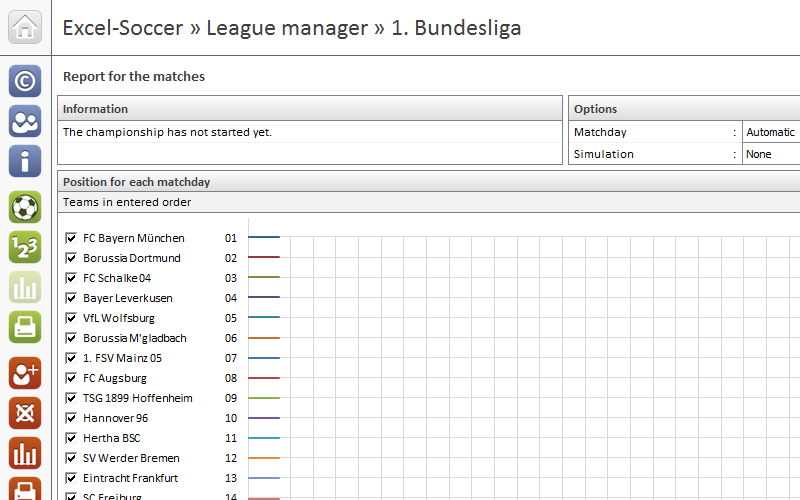 You can select the matchday or use the automatic calculation for the current matchday. 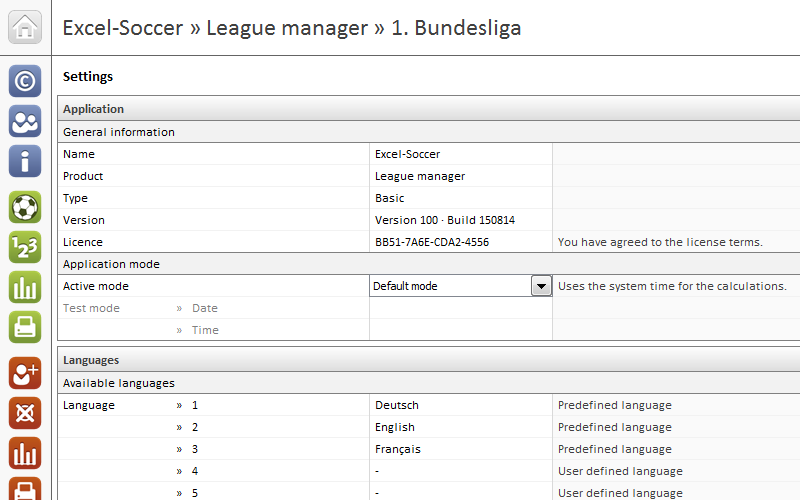 The settings for the Excel-Soccer allow to setup various options, for example for the language, for the teams, for the points given to the prediction game particpants and much more. Depending on the version you have downloaded, you should verify and setup these settings before using the application.